Last week at TechCrunch Disrupt, music startup NoiseToys launched with a demo of its iPhone app, Hitmaker. The app is now available in the iTunes store as a free download. This was one of my favorite products to launch at Disrupt, even though the company never made it past the first round. Hitmaker makes a game out of discovering and promoting music. 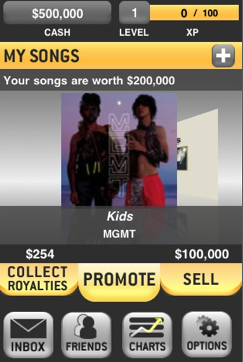 You get $500,000 in play money with which to “buy” real songs, which then change in value depending on how popular they become on the Web, in iTunes, and in the game. The idea is that you want to buy low when nobody knows about a song and sell high when it goes when it goes mainstream. You can pick songs from your own iTunes library, the top ranked songs on iTunes, the Hype Machine, or Last.FM, or the most-liked and most-recommended songs from Facebook. (It lets you login via Facebook Connect). Once you pick the songs you think are going to make it big, you then can start acting like a music mogul by promoting the songs to your friends in the game, on Facebook, or via email. You can post links to the songs on your Facebook Wall or target only certain friends. The more popular the songs in your portfolio become, the more they are worth. They also earn virtual royalties. The songs only play 30 second clips, but you can buy them on iTunes, which is sort of the point. The app would be more powerful if you could listen to an entire song and create streaming playlists. My other pet peeve is that when you try to promote a song on Facebook, it doesn’t play in Facebook, not even the clip. Instead it just inserts a link to iTunes, which isn’t the best way to share a song on Facebook. It would be better if your Facebook friends could listen to it inline and then decide whether they want to link off to iTunes or not. But the app is somewhat addictive even in its current form. The founders got the underlying game mechanics right, which is half the battle. Everyone always likes to brag about how great their taste in music is and how they were listening to R.E.M. or U2 before anyone else knew who they were. Well, now there’s a way to keep score. Like UJAM, another TC Disrupt startup that nearly stole the show, I am glad to see some new thinking being applied to the music industry. During rehearsals for Disrupt, both Mike and I thought NoiseToys would make it to the final five. Below is a video I took during rehearsals on my iPhone after the demo when the three Stanford-grad founders talked about their backgrounds. Co-founder Vivek Agarawal wrote one of the tracks in the movie Slumdog Millionaire (“Jai Ho”), while Mehul Trivedi worked at Apple on OpenAL (part of the Core Audio on the iPhone) and Shalin Mantri studied social influence at Stanford.